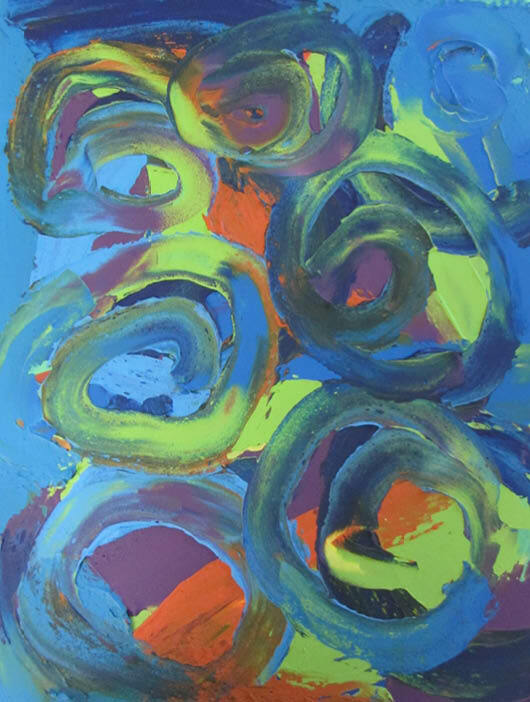 Choose original abstract art as the centre piece for your home if you’re mesmerized by bold textures and the blending of vivid colors found in modern abstracts. 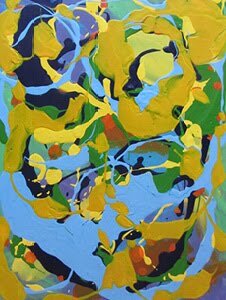 While shopping for your painting you’ll also discover that many contemporary abstracts go with everything you already have. 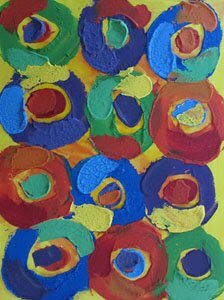 Are you searching for original artwork and not a wall hanging that looks like you’ve pulled it from a stack of reproductions? 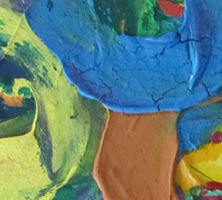 Reproduced art can be nice, but it’s just not the same as an original abstract painting. You’ll be pleasantly surprised by the price of original art these days. If you buy a painted canvas directly from the artist it doesn’t have to be expensive. 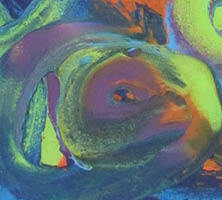 Another reason for buying original paintings from the artist is that you’ll save even more money. By using your new abstract painting as a focal point, the home furnishings and home decor items you already have seem refreshed. So furniture you may have considered replacing will seem appropriate to the space again. 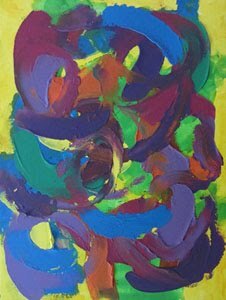 Choose your modern abstract painting wisely and it could be something you’ll keep over your lifetime and pass on, but most importantly people will notice the care you take in your home and your friends and family will feel welcome. 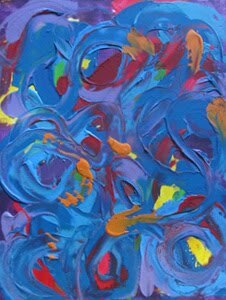 The abstract painting Raining Day Reflections shown above is painteded with thickly applied swirls in striking blue, purple, red, yellow and orange with some green undertones. All that surrounds a small rain puddle is reflected back in rippling organic shapes. This original wall hanging measures 18" x 24". Hanging abstract paintings is an easy way to redecorate. It takes minutes instead of hours. So don’t paint your walls another dull neutral color. The walls may look fresh for a few days, but after that it just falls flat and you feel tired in your living space again. A boldly painted canvas will do a better job. Wallpaper can be striking, but it’s a big undertaking. Beautiful abstract wall hangings are less hassle and may be better suited to the space you’re decorating. 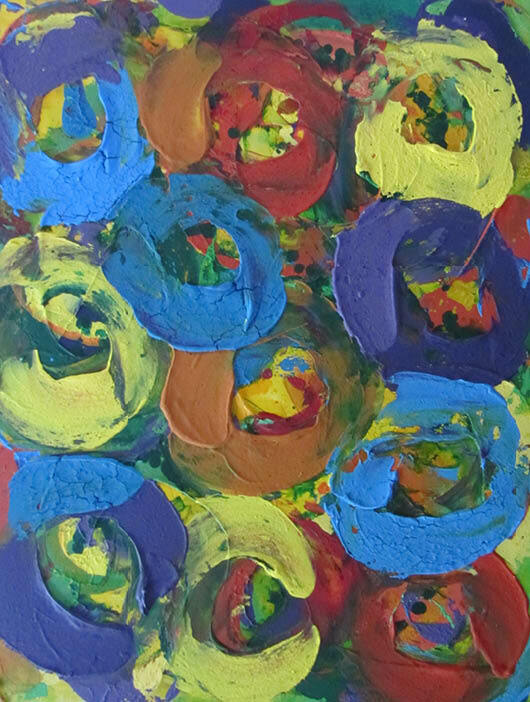 A colorful contemporary painting will evoke that bright welcoming atmosphere you want for connecting with family and friends. Also consider that sometimes you need to declutter your living area to revive it and create better flow. So rather than buy new furniture, clear up some floor space and hang more on the walls. It will give you moving around space while maintaining a lived in feeling, because while people like visually sparse living spaces, they're not as comforting. 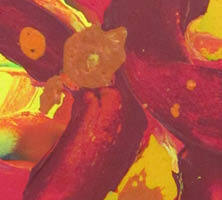 So fill up your walls with beautiful bold paintings for that warm inviting feeling. 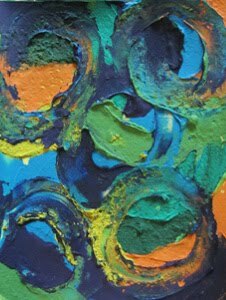 The abstract painting Howling Wind shown above is a textured acrylic with bold thickly applied paint in striking blue and green with orange and purple undertones. The wind swirls and howls between houses and trees picking up leaves and loose fitting hats then carries them away. This original wall hanging measures 18" x 24". 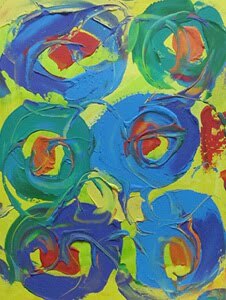 Shopping for abstract art to fit with your home decor? Follow some simple rules, look for strong brush movement across the canvas, interesting shapes, and bold colors with contrasting light colors to add depth and texture. Next look for something in the painting that has meaning for you. An abstract wall hanging needs to draw the viewer in with a hint of something recognizable. 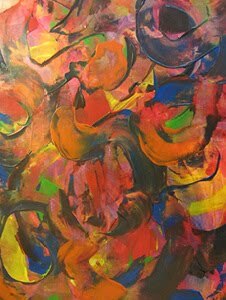 In my own modern abstracts I see the change of seasons, people walking arm in arm, street festivals, flowers blooming in the garden reaching for the sun, or waves crashing against the shore. I always have a new favorite contemporary abstract each time I paint in the studio. 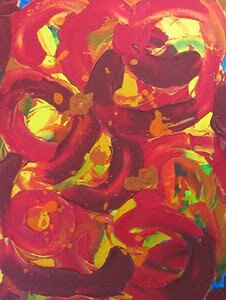 I love this predominately red abstract painting shown above with it's bold thick brush strokes and splashes of color. 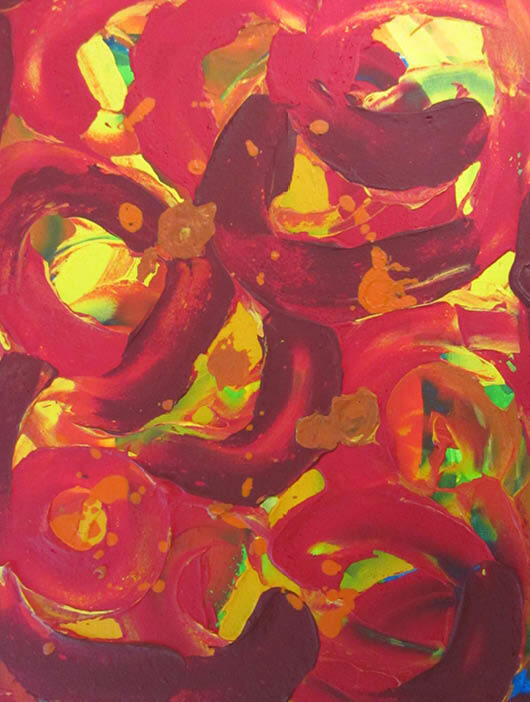 Red is happy and passionate, it supports and contrasts the lighter yellow and orange colors I’ve painted in the background making the overall artwork even more vivid. 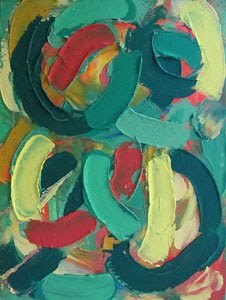 Abstract painting Happiness shown above is a textured acrylic with thickly painted swirls of bold red, orange, yellow with some green and blue undertones. Reunited and embracing, this couple with small children are swimming in the positive feeling of bliss. This original wall hanging measures 18" x 24".